This is the only recipe I use for banana bread. The streusel changes this into something amazing. Be careful to not overcook so the bread isn't dry. 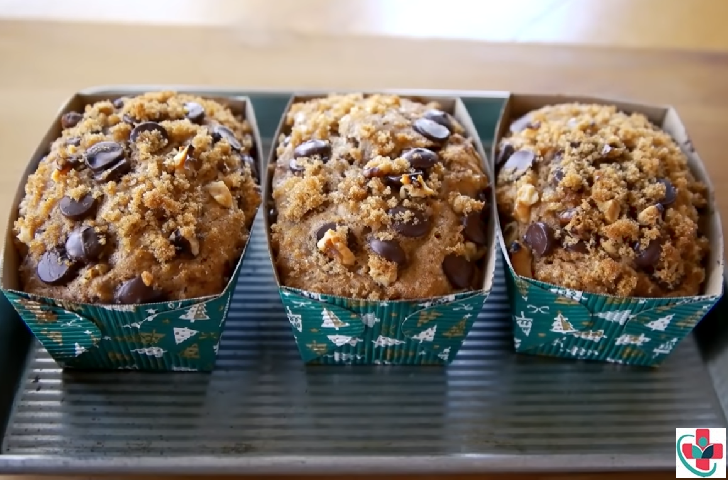 Ingredients ☛ ²/₃ cups semisweet chocolate chips ☛ ¹/₂ cup light brown sugar ☛ ¹/₄ cup chopped walnuts ☛ 1 tablespoon ground cinnamon ☛ 1 ¹/₂ cups all-purpose flour ☛ ³/₄ teaspoon baking soda ☛ ³/₄ teaspoon baking powder ☛ ¹/₄ teaspoon salt ☛ ³/₄ cup granulated white sugar ☛ 1 stick unsalted butter, room temperature ☛ 1 large egg ☛ 3 very ripe mashed bananas ☛ 3 tablespoons milk Instructions Preheat oven to 350°F. Spray a 9×5-inch metal loaf pan or 3 6x3 inch pans. For streusel - stir chocolate chips, brown sugar, and walnuts together in a small bowl. Set aside. Mix all purpose flour, baking soda, baking powder, cinnamon, and salt into medium bowl. Beat sugar, butter, and egg in large bowl until fluffy. Beat in mashed bananas and milk. Add dry ingredients and blend well. Spread half of the batter in loaf pan. Sprinkle with half of the streusel. Repeat with remaining batter and streusel. Bake until tester inserted into center comes out clean, about 50 minutes if using a 9-inch pan. If using the small loaf pans it's closer to 40 to 45 minutes. Cool loaf in pan on rack.